It's been a good weekend, although more expensive than I had intended! Yesterday (Saturday), I headed down to Long Buckby for a Knit and Natter meeting organised by the Machine Knitter's Guild. I took along Claire as my chief navigator (yay for Google Maps) and we got there in good time, with no serious mishaps other than a missed left turn which came up on us rather quicker than expected, with a distinct lack of signage. The meeting wasn't just machine knitting, far from it. I spent the morning learning about Tunisian crochet, which was interesting. I was working on a very small stitch count so I could make my swatch on a standard crochet hook - which was just as well as there were only so many proper crochet hooks available to borrow and Tunisian crochet proved to be very popular! 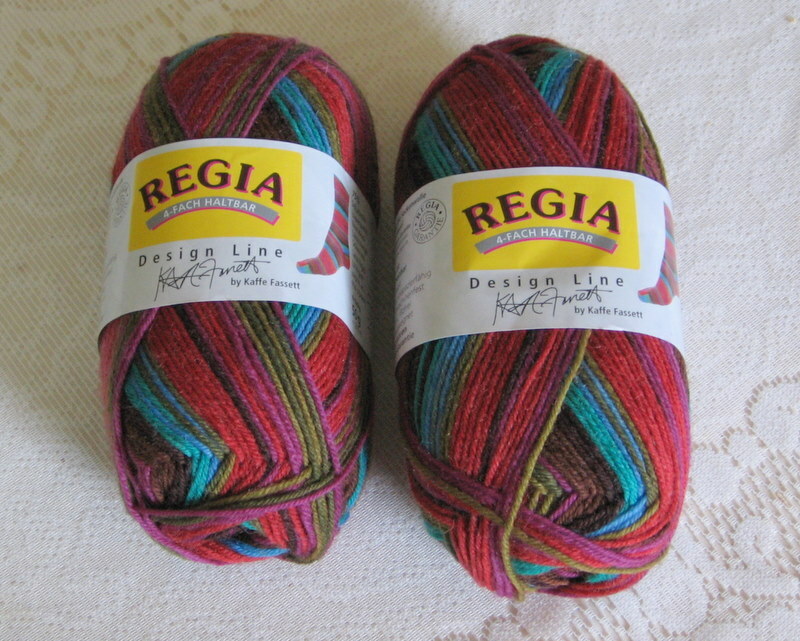 I succumbed to the lure of some reasonably priced James C Brett aran wool mix. In the afternoon there was a talk on surface embellishment from Fiona Morris, a knitwear designer (Ravelry link) and teacher of what I'd call textile art. What can I say other than wow! The lady knows her stuff and is very talented... An afternoon of listening to ideas and techniques to aspire to. Some time later, I dropped Claire home and borrowed a water pistol since mine is still in transit. I presented it to Dave a short while later, who immediately filled it and stalked around the garden squirting water everywhere. When I asked what he was doing, he claimed he'd seen a hint of ginger fur next door and began a barage of saturation fire across our neighbour's garden. Today, I headed off to Web of Wool with Christina. I wasn't intending to buy anything, honest! But this sock wool called to me. Other wool also called to me, but I did manage a tiny amount of self restraint and put it back. I picked up some crochet hooks as well, then headed home before I bought any of the other wonderful things surrounding me. You have won an award - see my blog!